I spent a bit of time this week refocusing on my FAL Q3 list. Tally up time of 'finishes' for this last quarter is 30 September. So far - not surprisingly - I am a bit behind target, with only this one finish! The quilt is pretty busy with all the various AMH prints, so connecting circles was my choice of quilting pattern. Annette certainly worked her quilting magic here! It gives it a nice texture, sort of sinks into the piecing on the front, without competing with the fabrics. For more decision making details about this quilt, see this post here. A few weeks to go yet, maybe I've still got time to tick another WiP off "the list". How is everyone else going with their FAL lists? and TGIFF over there too! Glenys & I are all signed up to go to a workshop at 'all things patchwork' with Kathy Doughty in September. I'm really looking forward to it! There are many options with this "Modern Wedge" workshop, we'll be learning all about using the Dresden Plate plastic template and how to put the wedges together to make (hopefully) really interesting quilts! Earlier this morning I sat down with a coffee and one of Kathy's books, Making Quilts, that I had borrowed from Glenys. I was hoping to get a few ideas about patterns & fabrics for the workshop, but instead I came across a quilt that I remembered starting ages ago, Greenfields. I had no pattern back then, just a photo in an old quilting magazine, a bunch of 5" Denyse Schmidt charm squares and just over a metre of bright fabric, a Kelly Green spot. I had jumped right in making up heaps of scrappy strips. Then it all got put away for a rainy day! ... it'd be a shame not to keep going with this now, yes? Needless to say, I haven't got very far with any decisions about fabric selection for the workshop! ... and a lovely surprise to see one of my quilts featured! After standing back and looking for a day, I worked out what was wrong with this quilt top! And it was so simple to fix... I unpicked one light pink block that was glaring at me and replaced it with a pretty peach/brown one. It seems to all blend together a bit better now, and I'm much happier too! and assorted others from my pre- modern stash. - with the brown values ranging from peach, orange, brown, and cranberry. Waiting now for some quilting fairy magic! Here's the link to culturalfusion quilts for more inspiration! ... this week there has been no sewing! And I have learnt how to make homemade Vietnamese spring rolls! My new sister-in-law has been staying with us and we are both learning lots of things from each other! And I also sorted out some of my quilts, all ready now for our Monday Modern quilt group show here in Auckland, NZ. "new quilts for alberton beds" is an exhibition of modern quilts in the historic setting of Mt Albert's Alberton House, built in 1863. The quilts will be all on display throughout the house, well worth a visit to see not only the quilts but the lovely old home too! My main focus was to try & combine my Anna Maria Horner fabrics with anything & everything! hm-m-m, not too sure if this is actually going to work or not! and there was one block that I just couldn't cope with - can you guess which one? Yep I agree, it is a bit colourful! Finished quilt top size - it's big - 2m x 1.75m! Well, the days have certainly felt warmer, but looks like we are in for more of the cold stuff this coming week. Here in NZ, and Australia too, spring doesn't officially begin until September 1 and ends November 30th, and our weather then is still like four seasons in one day ranging from cold & frosty to warm & hot, a little bit of everything really! I've spent some time sewing more blocks for my HST quilt. It's on my FAL Q3 list but I have neglected it lately! This quilt was inspired by a lovely Kaffe floral fabric, a simple design, and a quilt I'd seen in Jane Brocket's book. 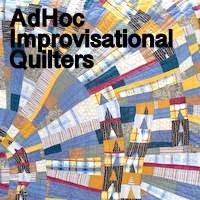 This quilt plays with the rhythmic value of the HST's, where the use of value is predictable & repetitive. It's fun to see how all the different fabrics play together! One 'couch quilt' now all ready for basting, quilting & binding. And I've finally finished sewing the binding down on my 'Beige & Red liberated log cabin' quilt. For details see earlier posts here and here. I had a few issues running out of fabrics, lots of scrappy improvisation along the way which was a lot of fun! My inspiration came from a combination of ideas from Gwen Marston's 'Liberated Quiltmaking II' book and also from a lovely quilt I saw made by LeeAnn at nifty quilts quite some time ago. I made a pieced backing from a selection of blending 'oldish' fabrics. The lovely clamshell quilting was done by Annette de Raat. Finished quilt size 1.80 x 1.65m. Linking up with Cynthia here for 'oh scrap' and to TGIFF over here are quiltmatters this week. And I'm still working away making more blocks using Sujata's rail fence design, exploring her free form process. I'm getting more adventurous with slicing that gentle curve too! It's addictive, the results are unpredictable, and each quilt will be very unique depending on your own lively fabric choices! More pics coming soon. Love the free form style, but I found precision matters especially when using plain fabrics. My joining seam lines stood out a bit... maybe the soft pink plain fabric is too much contrast? maybe I'm not as precise as I could be? Pressing helped, and using two prints was great! And it's definitely time for me to be a bit braver, and make those lengthwise slices just a bit wonkier! Here's the link to cultural fusion quilts if you want to see what others are doing too. Sujata's book Cultural Fusion is a new favourite of mine! There are quite a few quilts in it that appeal to me, and the irregular piecing is an interesting & creative process that I'm keen to explore a bit more. Karen here seems to be enjoying her book too, she's made two quilts from it already! So, I've been tossing up about joining in with the rail-fence-quiltalong! Love this quilt... and, while I'm juggling a few balls in the air, I figure I may as well throw in another and experiment! the more contemporary and graphically bold the quilt will be, so we shall see! ... I'll be back soon to share more! Well, sadly no news about my other sewing machine yet! I am keen to get back to sewing a few more of these daisies but won't risk changing machines mid flight! There's still plenty to be getting on with here in the sewing room though, using my faithful old Bernina. And I do have a finished quilt to share today... I just love how this turned out! 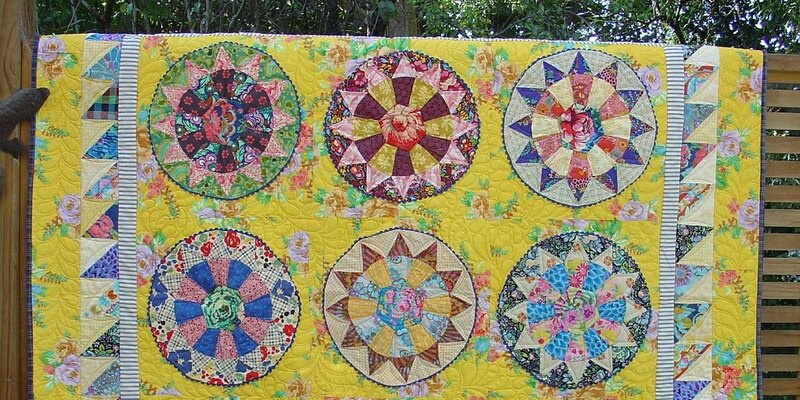 Thank you so much for all the earlier comments about my Drunkard's Path quilt, I enjoyed reading them! This quilt is all about the scrappy fabrics, and it's a real jumble of fabrics that's for sure... some old, some new, some pretty, and some not so pretty! I only used each fabric once, and kept the quilting minimal but functional, lots of simple straight lines running edge to edge, up & down. I opted for a brown floral backing... not my usual choice, I usually go for blue! But it's perfect for this really as I wanted to keep it all feeling 'warm' and, more to the point, I had just purchased a large amount quite cheaply at the latest Auckland Guild meeting! The two tone orange-y brown binding brings bit of restful calmness, makes all those warmer tones 'pop' and also helps blend the front with the back too I think. See here for more quilt details and here for the drunkards path tutorial that I used. And, what's up next? As you know, I'm always on the lookout for ways to use up my stash and when I stumbled across a delightfully scrappy quilt here, I was 'in love.' I contacted Stephanie re the pattern, turns out it isn't available just yet. ... perfect for another scrappy project sometime, don't you think?